Hi everyone! 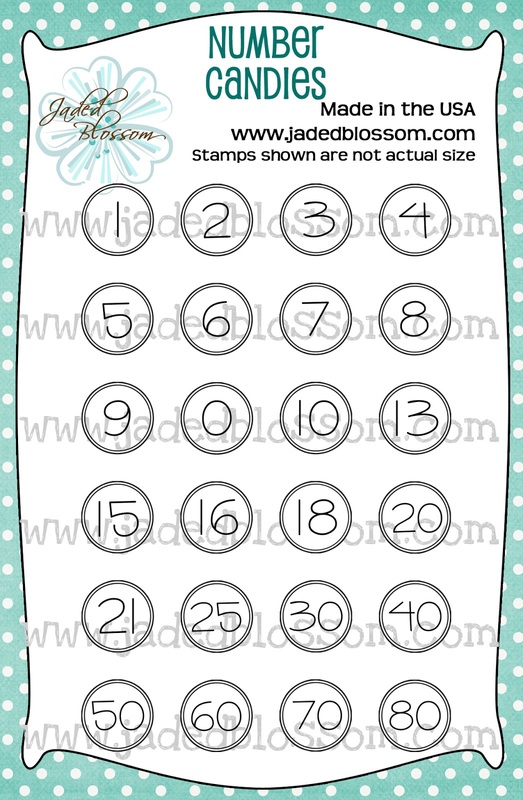 Happy Wednesday and welcome to day three of the Stamp Release reveal over at Jaded Blossom!! I am sooooooooooo excited to share my projects for today! I made these what feels like forever ago for my niece's birthday! This is Emma and she turned 4 on November 7th! 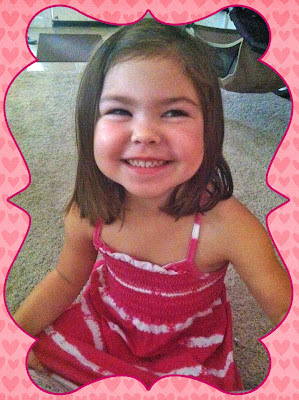 Isn't she just a cutie?!?! So if you saw today over at Jaded Blossom we revealed Alphabet Candies and Number Candies!! 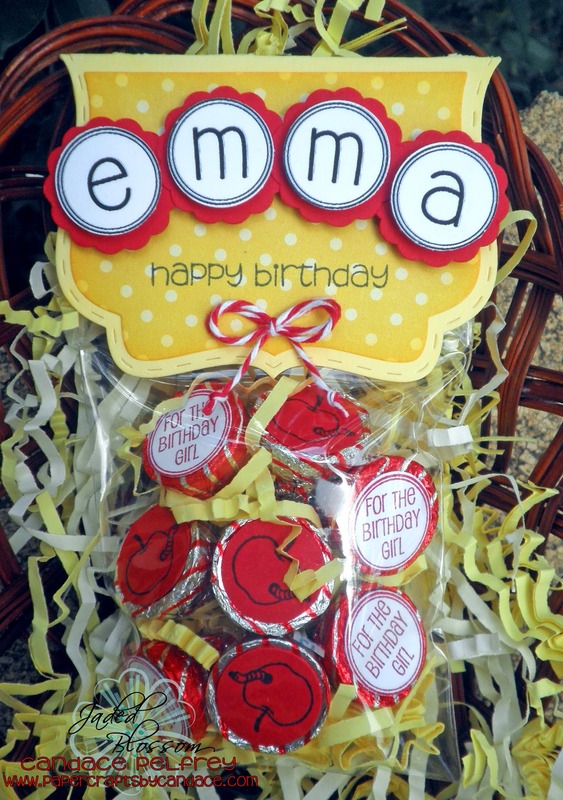 I knew I wanted to make this cute birthday girl a treat bag using the Alphabet Candies! She was having a Snow White themed birthday party so this is what I came up with! "emma" is from Alphabet candies. I punched them out using a 3/4th inch circle punch. I also punched out a 1 inch scallop punch to put behind them and pop dotted them. Happy Birthday is from the newly released Puppy Love! On the hugs in the bag "For the birthday girl" is from Birthday Candies and the apple is from Teacher Appreciation. I also used the Fancy Topper Die and our 3x4 inch clear bags. Now of course.. what birthday is complete without a card? So I had to make her a Snow White card that matched! 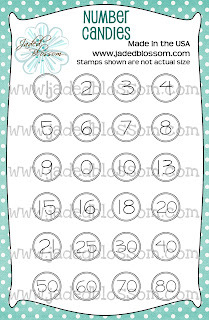 Again, Happy Birthday is from the newly released Puppy Love stamp set. Snow White was cut from Lettering Delights. And I used my favorite twine combo, Berries Jubilee from Trendy Twine! Thanks so much for checking out my project today! Make sure to come back tomorrow for two more stamp sets to be revealed!! She is so sweet!! And you are a great Aunt!! :) Both are adorable!! Love this new set!! So in love with the treat. Perfect for a snow white theme. And the card is adorable. Love the treat bag and the card. They are just so cute! I absolutely stinking love your project. Emma is fabulously adorable. I know she had to lover her card and treats. I just can't say enough about them...I super love the idea, the colors and the papers. I love this! That card is really cute. I love this snow white!!! Super Cute Treat and I just love that card. Your niece is so ADORABLE! I'm sure she had an awesome Birthday. Such a cute treat bag and I love that card! 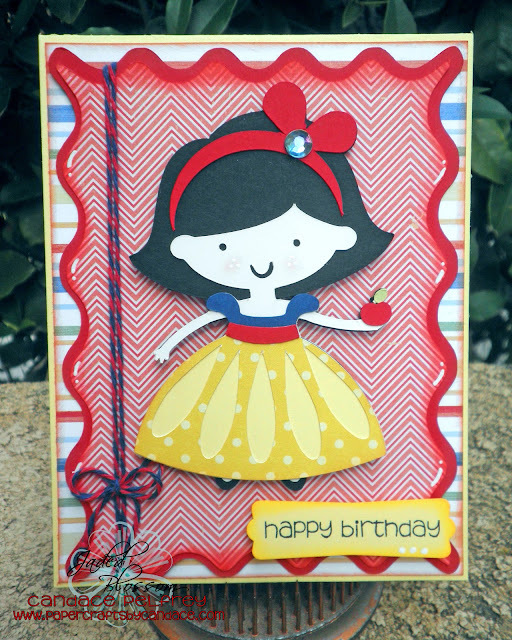 Love that Snow White card...SUPER cute and sassy! Adorable. Where did you get the cut for Snow White? This is just adorable and perfect for lil Miss Emma!!! So cute! !